This premier equestrian estate in Palm City Farms located in Palm City is perfect for the professional horseman. This is an enviable equestrian community on the treasure coast. This home sits majestically on fifty five acres. This property is conveniently located next to Interstate 95 and the Florida Turnpike. 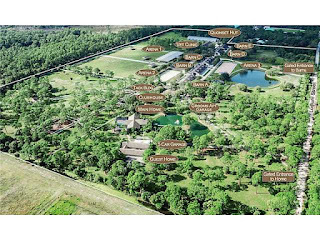 This property is adjacent to the two hundred and ninety acre Treasure Coast Wildlife Hospital. There is a beautiful remodeled three bedroom home with a fully screened in wrap around porch. A sparkling over sized saltwater pool and spa is a great way to relax after all the equestrian activities. There are seven barns and sixty eight stalls, three dressage arenas, one covered. There is an onsite vet clinic that has a lease. There are two garages for storage of nine vehicles. There is a grooms and guest quarters. There is a clubhouse with a kitchen to take breaks in. The lunging pen/horse walker and large paddocks are all set on pristine acreage. 5226 SW Ludlum Street is located in Palm City and is currently asking $4,900,000.00. Residents of Palm City Farms are in close proximity to fine shopping, dining, and entertainment at nearby world renown Orlando, Florida.